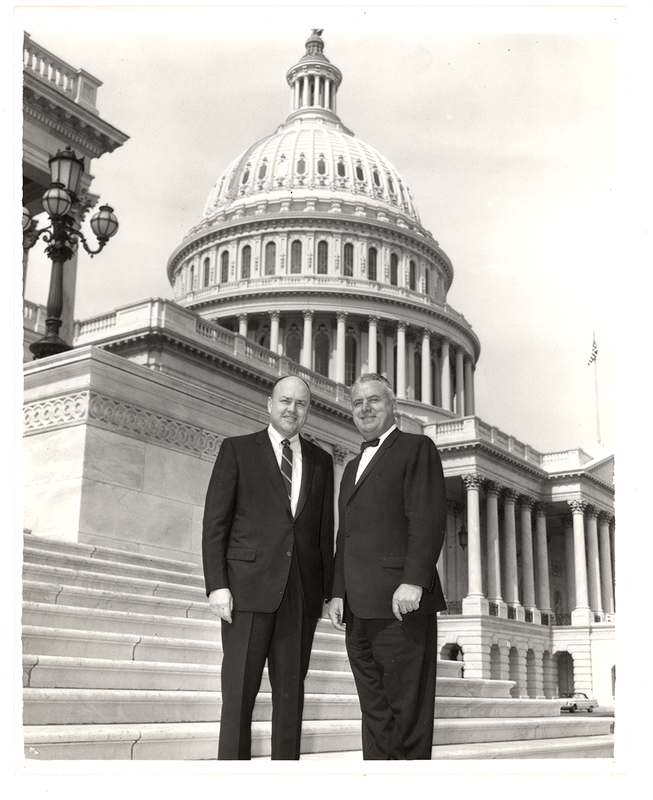 The NLM’s History of Medicine Division mourns the passing of Melvin R. Laird, former Republican congressman from Wisconsin (1953–1969), Secretary of Defense under President Richard Nixon (1969–1973), and senior White House Domestic Affairs Advisor (1973–1974) during the resignation of Spiro Agnew and the installation of Vice President Gerald Ford. During the spring of 2014, I had the privilege of interviewing Mr. Laird in a series of phone conversations, about his support of the NIH and the NLM. Later, in August of 2015, I had the greater privilege of meeting with him personally near his home in Fort Myers, Florida. During lunch on that hot summer day, as intermittent sun showers gave way to clear skies, we talked about the arc of his career, about the influence of the character of his father and mother on his dedication to public service, and about his fundamental belief in the value of bipartisanship and civil servants working together for the greater good. 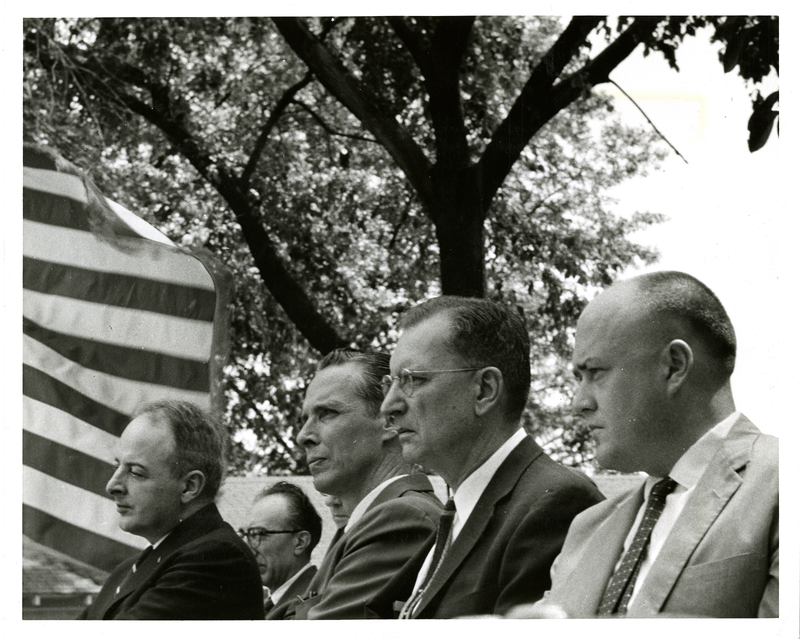 Congressman Melvin R. Laird was one of the many dignitaries present at the June 12, 1959, groundbreaking ceremony of the new National Library of Medicine on the campus of the National Institutes of Health. From left to right: Health, Education, and Welfare Secretary Arthur S. Flemming, Surgeon General Leroy E. Burney, Dr. Champ Lyons Chairman of the Library’s Board of Regents, and Laird. As our conversation returned to the history of his own public service, we talked about his time on the House Appropriations Committee for Defense, Health, Education, Welfare and Labor. In this position—and through what is now a legendary bi-partisan partnership with his fellow congressman John E. Fogarty, the Democratic representative for Rhode Island (1941-1967)—Laird helped ensure the success of the NLM, the NIH, and the Uniformed Services University of the Health Sciences. He was present at the groundbreaking for the institution I serve today. In recalling that event, as well as his alliance with Fogarty, Laird conveyed his passion for supporting medical research for the greater good, and how he came to that passion through mentorship by numerous physicians based at the Marshfield Clinic in Marshfield, Wisconsin. I noted how his commitment to the cause of health and well-being informed many other aspects of his career. We discussed his unwavering leadership of the “Go Public Campaign” of 1969, by which the U.S. government shifted its public policy on prisoners of war from giving them the “silent treatment” to shining a light on the POW issue, and thereby helping to provide POWs with the attention, medical care, and humanitarian treatment they deserved. We also discussed his leadership during the early 1950s—a time of religious revival in the U.S.—of several initiatives intended to support the spiritual health of the nation, namely the reform of the pledge of allegiance, to include “one nation under God,” the designation of a prayer-and-meditation room in the U.S. Capitol, and the establishment of “In God We Trust” as the official motto of our country. One of the most important things he taught us was to believe in yourself and do what you believe. Speak out. You can’t sit there and tell everybody that you think everything is terrible that’s happening if you’re not going to do something about it. He made you very much an activist and a volunteer. On the occasion of Melvin R. Laird’s passing earlier this week, let’s do more than remember him for all he did to advance the health and well-being of our nation and the world, and his honorable and skillful leadership of America out of the Vietnam conflict. Let’s honor him through our own public service, along the lines described so thoughtfully by his daughter, and, in the spirit and practice of his collaboration with his colleagues and friend John E. Fogarty, by working together for greater good of our communities, our nation, and the world. Learn more about Melvin R. Laird, and his relationship to the National Library of Medicine and the National Institutes of Health. Listen to Melvin R. Laird’s speech on June 12, 1959, during the groundbreaking of ceremony of the National Library of Medicine. The speech begins at 21:03 in the recording. Read a transcript of the proceedings. 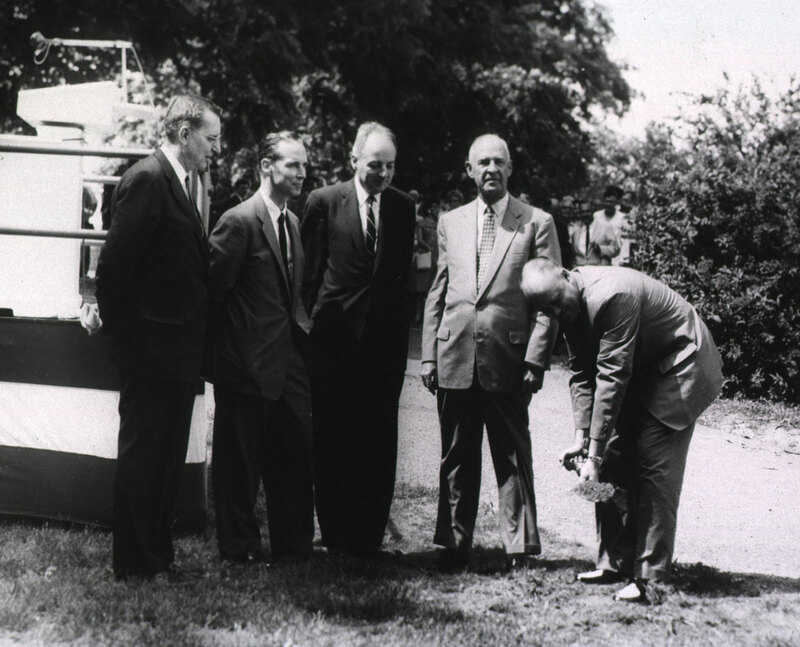 Representative Melvin R. Laird (far right) takes a turn at breaking the soil for the new NLM building on June 12, 1959. With him are (left to right) Dr. Champ Lyons, Chair, NLM Board of Regents, Dr. Leroy Burney, surgeon-general, U.S. Public Health Service, Dr. Arthur S. Fleming, secretary of Health, Education, and Welfare, and Senator Lister Hill. 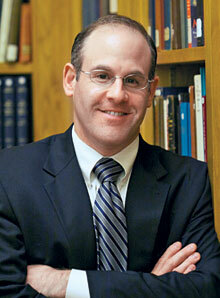 Jeffrey S. Reznick, PhD, is Chief of the History of Medicine Division at the National Library of Medicine. How inspiring to read that Mel so fully demonstrated “the value of bipartisanship” and “civil service”. We really need more of that recognition of the common good and willingness to work together. Thank you. I really enjoyed reading this article. I remember Laird as Defense Secretary, although I was just a young teen at the time. This article was an eye-opener. It gave me a new perspective on someone once associated with a presidency that was controversial, to say the least. Thank you so much! Thank you for your thoughts, and for reading our blog. The great privilege of meeting and speaking at length with Mr. Laird inspired me to write this post, and I myself learned a great deal more about him, both before and after our meeting, through his excellent biography by Dale Van Atta, With Honor: Melvin Laird in War, Peace, and Politics, published in 2008 by the University of Wisconsin Press. I highly recommend it! Thank you again for your feedback!